When traveling with kids, good travel resources can make a huge difference. Using perfect travel resources save you time and money. The right travel resources also make the overall experience of travel with children more enjoyable. Below I’ve listed up some of our favorite travel resources we use often to plan our family travel. Skyscanner is great for comparing flights fares among numerous airlines, and they offer up some of the most interesting options. For example, if the price is lower, Skyscanner may show a round-trip ticket using two different carriers. I also like to use their “Anywhere” option: simply enter your departure city and list “anywhere” as your destination and it will begin to display your options. Sometimes you’ll be surprised by the results. If the timing is right, there are occasions where flight across an ocean is cheaper than a may be 4-hour jump across your continent. I know families who have used this option to determine where they will travel next. CheapOair is another great flight search site. I like the way results are displayed in chart form, making it easy to compare, yet providing more detail easily if you want to explore further. What makes CheapOair great for us, however, is their personnel. I once entered the wrong age of the kids (duh) when booking in a rush. When I called the company to get it fixed, they went the extra mile to handle it quickly. We won’t forget that. We recently found Kiwi.com and are loving it. If you don’t know where to go, but just want to know where you can go on whatever the budget you have, then search flights on Kiwi.com. They show you the lowest fair to go to different destinations from where you plan to fly out. I have a feeling that we will be using this search engine a lot more in the coming future. This is my first stop when looking for places to stay with kids, basically because of their coverage (800,000+ hotels in 200+ countries) and the fact that you can book most places with free cancellation. We sometimes book one place here just to be safe, and then start looking for better deals. If I find one — and I usually do, often with a “non-refundable” option — then I book the place with a better price and simply cancel the first one. We’ve never had a problem doing this. We’ve regularly used and recommended Agoda because of its strong presence and good deals in the East. We’ve searched and booked with Agoda the most when traveling with kids in Southeast Asia, and we’ve never had any problems, but whenever locating accommodation in SE Asia, it’s always a good idea to confirm directly with the hotel after booking. In general, places in SE Asia tend to prefer walk-in guests (ie. immediate cash) over pre-booked guests (ie. possible cancellation). We’ve used Agoda for a variety of rooms in Thailand (Bangkok & Krabi), Malaysia (Kuala Lumpur), and other places. I’ve always contacted the accommodation directly after booking, and have never had an issue. HotelsCombined is great for providing multiple options using more than 10 booking companies. It basically searches the best prices across the internet, giving you a better idea of your options. They not only search major booking companies like Expedia and Hotels.com, but also smaller companies. To be clear, when it comes to “deals,” be smart — too good to be true often is exactly that: untrue. That said, HotelsCombined is still great resource to assess your range, and can therefore give you more leverage for negotiation with specific hotels later on. If we’re staying in a place for more than a week, then we usually look at Airbnb options first. Sure, we’re giving up housekeeping and “breakfast included” (although some places do offer these as add-ons), but we usually feel more at home when we’re staying in an apartment or a house. The service, of course, varies depending on the property, the location and the hosts, but overall we’ve had a great experience. Most places we’ve stayed were larger than hotel rooms of equivalent value, and as a family of four (including one teen and one tween) personal space is a treasured commodity. Want to give Airbnb a try? Use this link, you’ll get US$40 off of your first stay. Some people skip the travel insurance. We are not those people. When I was younger and (mistakenly) thought I was invincible, I will admit to a lack of coverage for some time, but now with a family of four, there’s no way I’ll take that chance. The world is a lot safer than many people imagine, but accidents and bad luck are part of life: bags get lost, kids get the flu, and airplanes are delayed because of this or that, making you miss a connecting flight. We’ve had the good fortune to not need World Nomads Insurance to step in and help with something serious (excuse me for a moment as I look for some wood to knock on), but I know of several families who have. There’s the story of one mother who had to have her son medevaced out of a remote location after breaking an arm, and then on episode #42 of the Epic Education Radio Podcast, Jason Marshall mentioned that his mother-in-law died suddenly in Texas, while he and his family were in Turkey. World Nomads covered all of their airfare back for the funeral, and they also refunded several flights that Marshall’s family missed because of the sudden change in plans. 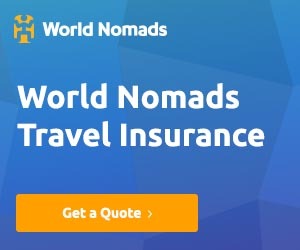 World Nomads provides insurance for travelers from over 150 countries. They have medical and evacuation coverage, 24-hour emergency assistance and cover a large range of adventure activities that families like ours may consider, including trekking, motorbiking, bungee jumping and whitewater rafting. You can even buy your coverage plan after you’ve already started traveling (there is certain waiting period). You can extend your insurance period while on the road as well (that’s what we did), if you want to continue traveling beyond original ending date. We like World Nomads and have used many times. I’ve had a complicated relationship with Trip Advisor, but I still use the site regularly. It’s still a great resource to tap into the well of traveller opinions, but the key is to understand that many reviews are based on subjective experiences and personal agendas, and your experience could be completely different than what you read. You have to read the reviews with filters on, and remember that many of the reviews reflect more about the person writing than the place itself. Yes, it can be time consuming to make all these social and psychological assessments from such tainted data, but calculations like these can reap huge benefits in the form of better stays, meals and experiences. A vital component of our travel supplies is reading material. It can be hard to find books in English where we travel, and most of those opportunities come in airports, with their limited selection. The alternative used to be carrying all your reading material with you, or gambling on finding the right used book store or backpacker hostel with a bookshelf, but carrying stacks of actual books becomes an issue when you want to travel light and long-term. Enter the Kindle reader. We have two of these bad-boys, and they allow us to carry dozens of books wherever we go. It could be thousands of books, if we were that voracious of readers. But with a kindle, you can. For kids and adults alike, we recommend buying the simpler Kindle models without games, apps or color screens. We don’t use the Kindle app on our iPhones/iPads very much, either. We want our Kindles to be books and books only, and there are more than a few studies linking the blue light emitted from laptops and other screens to prolonging the time it takes to fall asleep (your brain links blue light to sunlight and waking up). We stick to models with e-ink. We already have two iPads, so we don’t need more devices to do what an iPad can do. Kindles have been a crucial component of our children’s travel experience, as well as their education, since both consider English their second language. Now they always have something to read at the airport, in long lines at embassies and immigration offices, and when the internet goes out wherever we are. Kindles are a no-brainer. Get one, or get some kind of e-reader. And if you have more than one kid and have the budget for it, I sincerely recommend getting more than one Kindle. It will stop many arguments. These devices played a crucial role in our kids’ homeschooling for over two years, and continue to be used now that they’re in local Spanish schools for reading news, keeping up with classes and translating the heaps of Spanish & Valencian material we don’t yet fully understand. Do our kids sit and watch videos during family time or in restaurants? Not our style. No, these devices are for other purposes, such as researching, drawing, reading the news, editing photos, communicating with friends and working on math, science and history. Yes, there’s an app for all of those. They are, of course, entertainment devices as well: Spotify, Youtube, Instagram and a handful of games get a lot of use with us too. The two iPads are shared among the family, but the iPods are for kids only. Having an iPod to themselves gives them not only the freedom to customize it for their needs, but it also gives them a sense of privacy, which is becoming increasingly important as they become teens. iPods are where they keep their own music and games, and where they keep in touch with family and friends (old and new) using apps like Skype, KakaoTalk and Instagram. These are our life line. We have one MacBook Pro and two MacBook Air models, and we use them every day. The kids occasionally use iPad for their school projects, but we prefer them to use a laptop. It adds to our total travel weight but laptops play so many important roles in our work, our education and in our lives in general that it’s worth having three with us, and MacBooks are relatively light and sturdy machines. They are our studio, our office and our darkroom. They are our telephone to family, or interface to our readers, and our cinema for family movie night (thanks HDMI cord!). We are not Apple fanboys per se, but for the time being they are the best machines on the market for us. Disclosure: This post contains affiliate links. This means, at no extra cost to you, we might receive a small commission if you book something or make a purchase using those links. My opinions are my own and I only recommend places/services that I believe will genuinely help your travel.